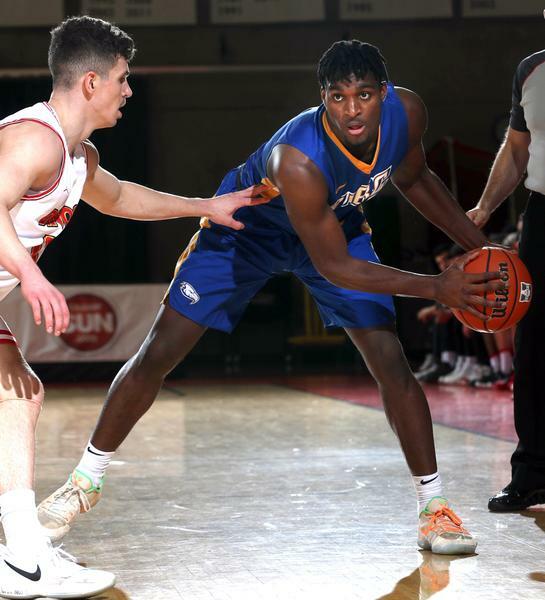 The UBC Thunderbirds men’s basketball opened their three-game semifinal series against the University of Calgary Dinos last night — it wasn’t the result they were looking for. After a strong start for UBC, the Dinos would play a commanding second half en route to a 98-71 blowout victory to take the series opener. The Thunderbirds face a challenging hurdle if they hoped to make it to the Canada West final. Adjusted for schedule difficulty in the RPI system, the Dinos finished the regular season ranked second in the Canada West conference — just ahead of UBC. After dropping both regular season match ups between the teams, the Thunderbirds had their work cut out for them as they faced a conference heavyweight. UBC opened the first quarter in promising fashion. Though the Dinos were stringent defensively, including two early steals by U of C’s Mambi Diawara off of Conor Morgan, the ’Birds were able to set up nicely and find shots from beyond the arc. Their three-point shooting would be 6-10 in the first quarter, helping them build a 26-17 lead by the end of the period. Into the second, UBC’s shooting went cold. Throughout the remainder of the first half, they would go 0-6 from the three-point range. When their long shots weren’t falling, the Thunderbirds’ offence was simply no match for the tight defence of Calgary. The Dinos seemed to be one step ahead of every move the offence made and would finish the half with nine steals. UBC would put up just 16 points in the quarter, as the Dinos clawed back to take a 45-42 lead by the half-time buzzer. To open the second half, UBC’s attempts to work their offence to the basket became more desperate and futile. Calgary remained just as tight defensively and their offence continued to build on the momentum they had generated in the second quarter. On the shoulders of stellar performances by veteran Dinos guards David Kapinga (28 points) and Mambi Diawara (23 points and 9 rebounds), the Dinos lead by as many as 21 points and would handily close the quarter up 73-55. The final quarter would ultimately prove no different for the ’Birds — most of the closing minutes were played as garbage time since both teams rested their starters in preparation for the second game of the series. The Dinos would tack on 25 more points in the final period to close the game at 98-71. For UBC, it seemed like the Dinos’ interior defence was simply too strong and when they weren’t making three pointers, their offence was at a loss. The ’Birds were unable to find lanes to drive into the paint and their inside passes simply weren’t connecting. They would finish the night with 26 total turnovers. Though UBC veteran Morgan posted a double-double, the only real standout for the Thunderbirds was rookie guard Anthony Mcnish who scored 19 off the bench — he played 26 minutes in total. Mcnish seemed to be the only player who was able to successfully drive to the basket on a regular basis, while the rest of the offence was held to the perimeter. He may be an important factor if the ’Birds hope to find a solution to the Dinos defence and tie up the series. It’s going to be a long wait for the UBC team as they look to regroup before tipoff for tonight’s 7 p.m. must-win game. Their play in the first quarter of last night’s game is a sign that beating the Dinos may not be an insurmountable task – though it certainly won’t be easy.